Exit 2 Bar & Grille will celebrate its fifth anniversary with a fun-filled party from 7 to 10 p.m. Saturday, Nov. 17. 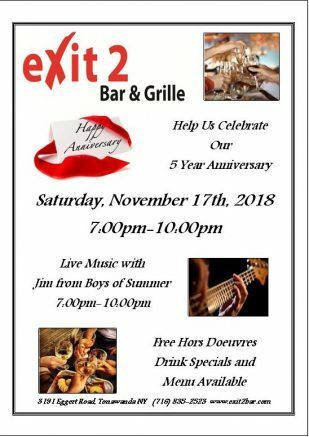 Exit 2 Bar & Grille, located at 3191 Eggert Road in Tonawanda in the Colvin Eggert Plaza, just off Exit 2 of the I-290, will celebrate its fifth anniversary with a fun-filled party from 7 to 10 p.m. Saturday, Nov. 17. The event will feature live music with Jim from Boys of Summer, complimentary hors d’oeuvres, drink specials and much more. Additionally, the public is invited to stop by any day to try new menu items skillfully prepared by Executive Chef Christopher Schork. Kicking off the upcoming holiday season, Mo Porter will perform at Exit 2 Bar & Grille on Wednesday, Nov. 21, the night before Thanksgiving. You can even complete some of your holiday shopping at Exit 2 by purchasing gift certificates for everyone on your list. During the holiday season you’ll receive an extra $10 gift certificate for every $50 gift certificate purchase! Exit 2 Bar & Grille is also available for holiday parties. Please call 837-2523 for details or to book your event. For more information on Exit 2, please visit www.exit2bar.com or call 837-2523. You can also follow Exit 2 Bar & Grille on Facebook at www.facebook.com/Exit2grille for frequent updates. Be the first to comment on "Exit 2 Bar & Grille plans five-year anniversary party and more"